Books and memorabilia on the German leader's life have found a steady market in some sections of Indian society where he is idolised and admired, mostly by the young. The numbers are small but seem to be growing. But the truth is that books, T-shirts, bags and key-rings with his photo or name on do sell in India. And his autobiography, Mein Kampf, sells the most. 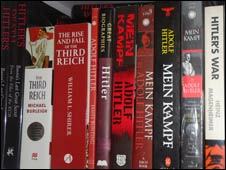 Jaico, the largest publisher and distributor of Mein Kampf in India, has sold more than a 100,000 copies in the last 10 years. Crossword, an India-wide chain of book stores, has sold more than 25,000 copies since 2000 and marketing head Sivaram Balakrishnan says: "It's been a consistent bestseller for us." And demand seems to be growing. Jaico's chief editor RH Sharma says: "There has been a steady rise of 10% to 15% [over what period?] in the book's sale." The more well-heeled the area, the higher the sales. [This is important: it's the influential classes that admire Hitler the most.] For example, the Crossword outlet in Mumbai's affluent Bandra district sells, on average, three copies a day. The book has several editions and is available in vernacular Indian languages too. Mannyes Booksellers in the western city of Pune keeps at least four editions. There are at least seven publishers now competing with Jaico. Global sales figures for Mein Kampf are hard to come by, but the book sells well in other parts of the world too. In the US, it sold 26,000 copies last year 2009. In 2005 it sold 100,000 copies in Turkey in just a few months. The Arabic imprint is popular in the Palestinian territories. Mein Kampf is published by Random House in the UK but the company would not give sales figures to the BBC. It's not just the autobiography - books on the Nazi leader, T-shirts, bags, bandanas and key-rings are also in demand. A shop in Pune, called Teens, says it sells nearly 100 T-shirts a month with Hitler's image on them. Prayag Thakkar, a 19-year-old student in Gujarat state, is one of them: "I have idolised Hitler ever since I have had a sense of history. I admire his leadership qualities and his discipline." The Holocaust was bad, he says, but that is not his concern. "He mesmerised the whole nation with his leadership and iron discipline. India needs his discipline." Shilpi Guha says she started reading the book but could not finish it and she wouldn't like to dwell on the dictator's negative side. In the past, a couple of right-wing Hindu leaders [e.g. Subhas Chandra Bose, who went to Germany during the war] have also expressed their admiration for Hitler. But young Indians' fascination for him has been explained succinctly by academic Govind Kulkarni: "The youth look for a hero, a patriot, and Hitler was a committed patriot. He is seen as someone who can solve problems. The young people here are faced with a lot of problems." Mr Kulkarni says he believes the young are gullible and fail to see the sinister side of Hitler. "Young people have no sense of history. The book is thick and not easy to understand unless you know the history of Germany," he says. Amit Tripathi, a Mumbai-based scholar, read the book a long time ago but just out of curiosity. While a Class VIII student is taught 'negative aspects' of Gandhi's non-cooperation movement, the Class X social studies textbook has chapters on 'Hitler, the Supremo' and 'Internal Achievements of Nazism'. The Class X book presents a frighteningly uncritical picture of Fascism and Nazism. The strong national pride that both these phenomena generated, the efficiency in the bureaucracy and the administration and other 'achievements' are detailed, but pogroms against Jews and atrocities against trade unionists, migrant labourers, and any section of people who did not fit into Mussolini or Hitler's definition of rightful citizen don't find any mention. "They committed the gruesome and inhuman act of suffocating 60 lakh Jews in gas chambers" is all the book, authored by a panel, mentions of the holocaust. 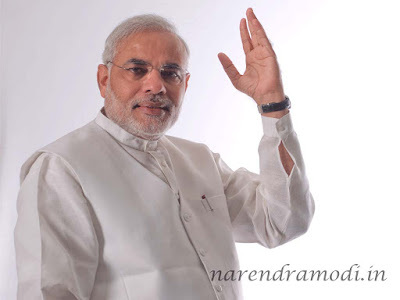 Narendra Modi, Governor of Gujarat. Balasaheb Thackeray is the founder of Shiv Sena, a right-wing populist party based in Mumbai (Bombay) which began in 1966 championing the rights of local workers against the use of immigrant workers from other provinces of India, but is now aligned with the Hindu People's Party. Interviewer: "You've been quoted as saying there are some misconceptions about your admiring Hitler. What is the actual position?" Bal Thackeray: "I admire everybody." Bal Thackeray: "Yes,if they have qualities, if they have qualities." Interviewer: "So now you admire people who have qualities." Bal Thackeray: "It's for you to find out if they have qualities, and no qualities." Interviewer: "But seriously, everybody does." Bal Thackeray: "Uh, Hitler, I don't admire him for one thing: because of that massacre of the Jews. Interviewer: "Let's take the Holocaust out of it. The rest of what Hitler did? Bal Thackeray: "The way he used the speech. He, he had that command effect. At that time the people had gone mad, mad. So that type of a thing, you must admire to that extent, that this is the man who actually made their money. And then you will blame Hitler for rights." Interviewer:"Mm, just the small matter of the Holocaust, but we leave that aside. Now go on." Bal Thackeray: But something, some miracle, some hypnotic thing was there, That you must say, yes. What hypnotic powers he has! Why people go behind him? That is word-spreading!" Interviewer: So you also are on record saying you admire Hitler's patriotism. You admire his patriotism, his hold on the masses, but you don't approve of the Holocaust. Bal Thackeray: "Yes, no Holocaust." Without the Holocaust, Hitler is totally admirable to Bal Thackeray. Somebody should send him a copy of Did Six Milion Really Die?